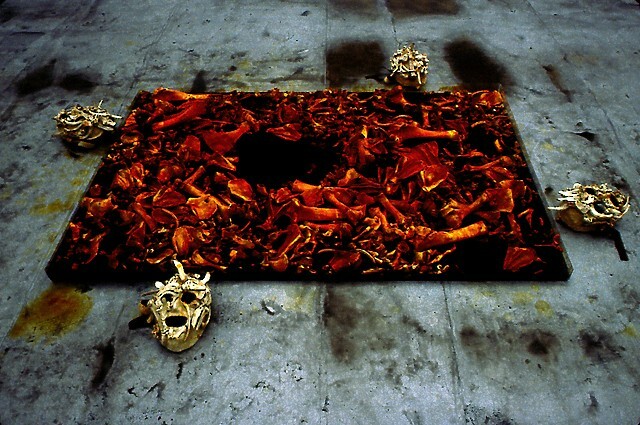 The event called No Sign of Dying Soon was prepared for the end of the Studio Semester Program which the artist attended at the New York State University, in May 1995. Animal bones were scattered across the roof of the 12-story building where the studios were located, and four participants of the program were asked to wash them in iodine. The washing, or in fact sterilisation, continued until all bones were picked up and placed in a large iodine-filled bowl at the feet of a musician standing in the middle of the roof. The musician (Frank London) played trumpet. He was dressed in an elegant suit, and the concert lasted for 45 minutes. The other participants wore specially designed masks. The artist asked them to converse, remembering stories from the past, family ones in particular.